Linking Swaine Street with Astley Street, just east of Stockport viaduct, the new 38 metre Mersey Bridge will provide a two-way link for buses, taxis, cyclists and pedestrians between the A6 and the planned transport interchange via Heaton Lane, making it easier for passengers to change between different stages of their journeys. Funded as part of the Greater Manchester Growth Deal programme, the bridge is the first stage of preparatory works for the town centre’s new transport interchange. Having successfully won the bridge contract last year, construction firm Osborne has now begun work on-site. Over the coming months the contractor will be carrying out ground investigation, excavations and piling of foundations ahead of the bridge’s steel beams being lifted into place and the construction of the bridge itself. Mersey Bridge is due to open to traffic in 2019. 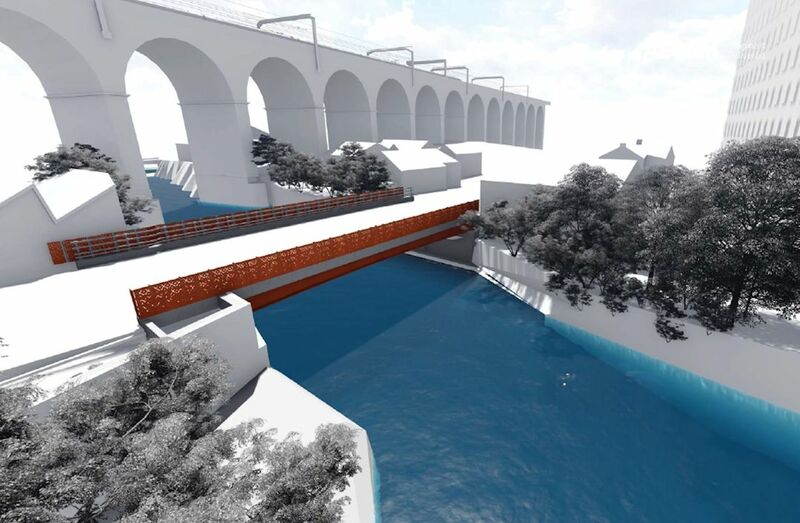 Being developed by Stockport Council and Transport for Greater Manchester (TfGM), the bridge is one of the latest transport investment projects to get off the ground in Stockport. The town is serious about investing in its future and is currently investing £1 billion in a range of ambitious projects, each transforming the borough. As part of this, significant investments are being made into improving transport and access for all, making it easier for everyone to travel into and around the town centre, regardless of how they travel; work that is already bringing real benefits to Stockport. The Mersey Bridge and transport interchange are key to this work. “The Mersey Bridge link is the first step in developing a new transport interchange for Stockport town centre. The start of work is a big step forward in improving access into the area, making public transport easier for everyone to use,” commented Mark Glynn, Strategic Head of Place Management at Stockport Council. Alex Cropper, TfGM’s Head of Projects Group, said: “It’s great to see that work has started on the new road bridge over the River Mersey. The bridge is a significant piece of infrastructure which will improve traffic flow and journeys in general in the local area, as well as access for buses to the bus station and to the new interchange, which we plan to build on the bus station site in the future. “The new interchange will make it easier to travel to, from and around Stockport benefiting drivers, passengers, residents and businesses. To find out more about the investment work taking place in Stockport visit the Invest pages of our website.